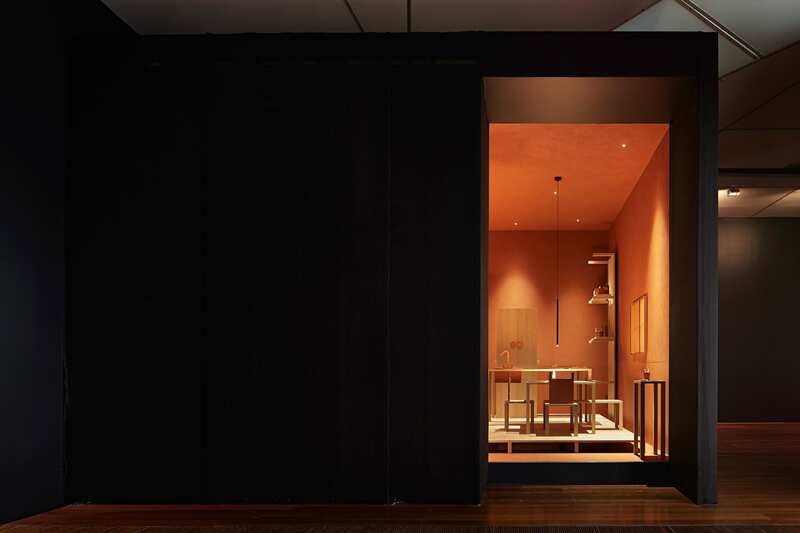 National Gallery of Victoria has revealed a major presentation that celebrates contemporary Australian interior design, featuring ten bespoke, purpose-built rooms by ten shortlisted Australian interior designers and decorators. For the Rigg Design Prize exhibition, each studio has been invited to design a purpose-built interior that responds to the 2018 theme of ‘Domestic Living’. 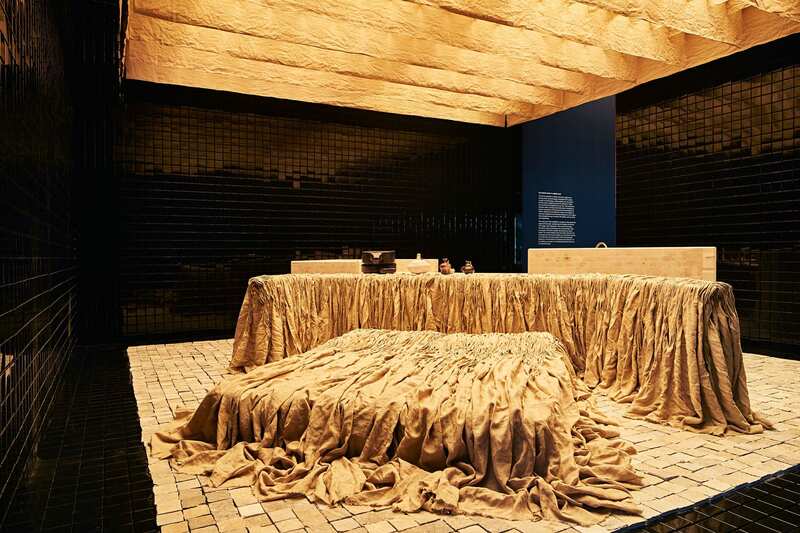 NGV has asked each design studio to produce an interior that demonstrates how designers create interiors as forms of communication embedded with values, ideas and stories that directly engage with the cultural, historical, material and technological aspects of society. The ten participating designers and practices are: Amber Road (NSW), Arent & Pyke (NSW), Danielle Brustman (VIC), Flack Studio (VIC), David Hicks (VIC), Hecker Guthrie (VIC), Martyn Thompson Studio (VIC), Richards Stanisich (NSW), Scott Weston Architecture Design (NSW) and The Society Inc by Sibella Court (NSW). 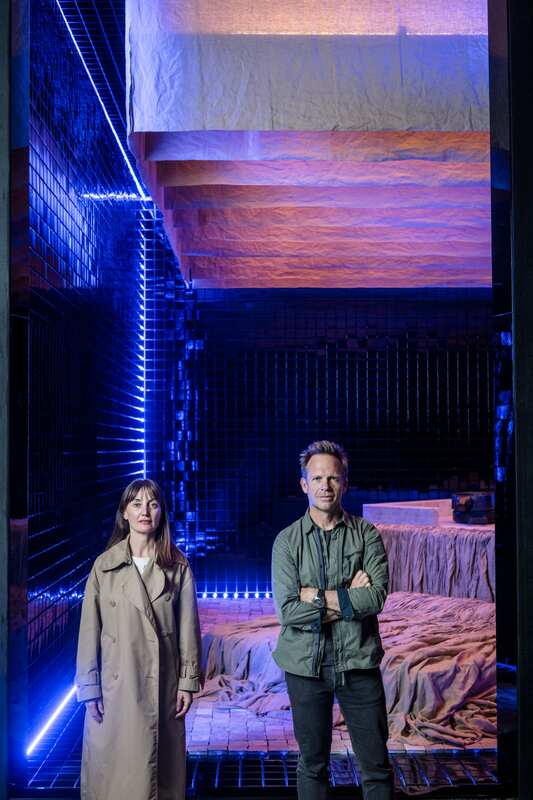 Melbourne design practice Hecker Guthrie has been awarded the prestigious Rigg Design Prize for 2018, the highest accolade for Australian contemporary design. 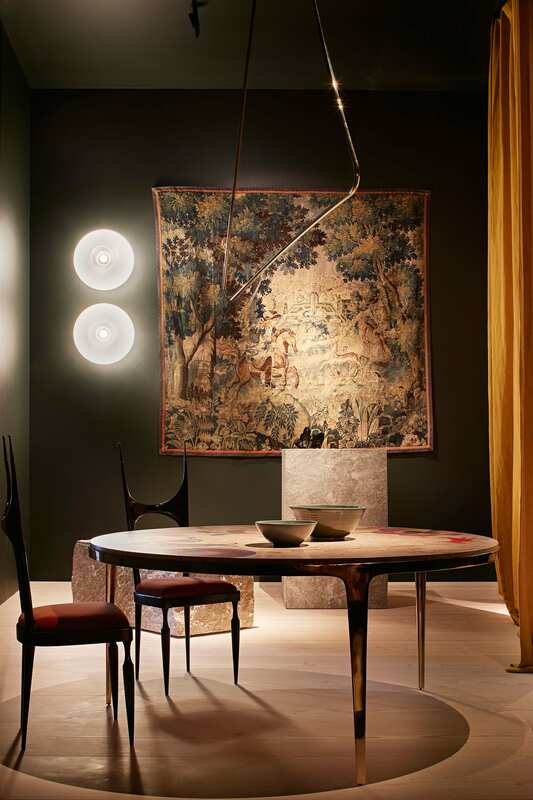 Lead designers Paul Hecker and Hamish Guthrie created an interior ‘The table is the base’, which celebrates the table as a modest yet powerful object, often pulling and binding people together as they gather around it. Huge congratulations to Hecker Guthrie on their deserving win, and also to all participating Australian designers on a seriously stellar effort. Before we take a closer look at each of the installations below, I couldn’t resist sharing a quote from Kirsten Stanisich, co-director of the newly launched Sydney-based studio Richards Stanisich, who says – “The Rigg Design Prize is an incredible platform that represents the diversity of Australian interior designers, and helps the general public to understand just how much interior design can affect the way we feel in a space.” Word. 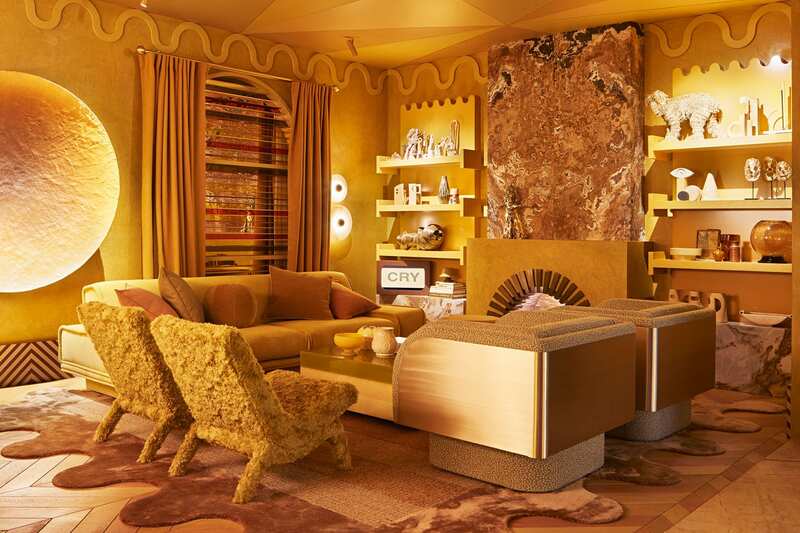 Go Australian Interior Design – GO! The Rigg Design Prize 2018 exhibition is open until 24 February 2019 at Ian Potter Centre: NGV Australia at Federation Square. Entry is FREE. Installation view of The table is the base by Hecker Guthrie. Photography by Shannon McGrath. 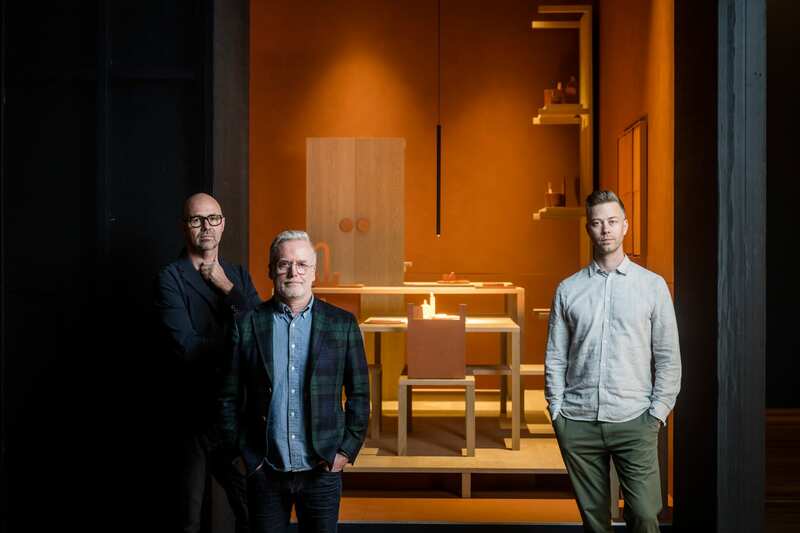 Designers Hamish Guthrie, Paul Hecker and Josh Watt in front of The table is the base, inside the Rigg Design Prize 2018 at The Ian Potter Centre: NGV Australia. Photo by Eugene Hyland. THE TABLE IS THE BASE by Hacker Guthrie // Hacker Guthrie’s Award Winning concept for Rigg Design Prize 2018 celebrates the table as a modest and unassuming object with an invisible gravitational pull that brings people together and binds them in space. Our domestic lives seem to be perpetually in orbit around this singular object. The table is where we eat, drink, play, gather, converse, work and create. 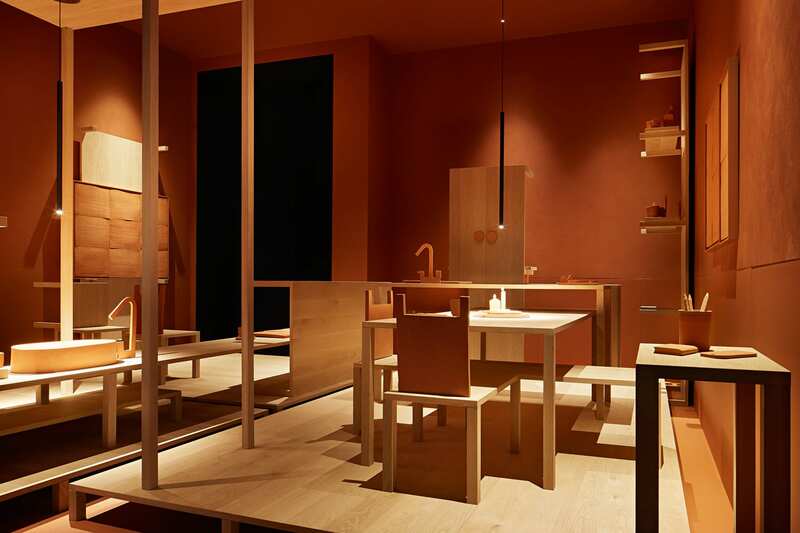 For Hecker Guthrie, the table is a ‘subtle muse’ that inspires bustle, encourages stillness and is a place of reflection and assembly – a domestic totem summoning familiarity. The intent of this installation is to conjure an emotional, and possibly nostalgic, connection to the table as an object. The controlled, minimal palette allows the many interpretations of the table form to become visible. The designers have set out to transcend the idea of the table as merely objectified furniture by stripping the structure back to its most basic and recognisable form so that aesthetics become secondary. Designers Kirsten Stanisich & Jonathan Richards in front of Our natural needs in a digital world, inside the Rigg Design Prize 2018 at The Ian Potter Centre: NGV Australia. Photo by Eugene Hyland. Installation view of Our natural needs in a digital world by Richards Stanisich. Photography by Shannon McGrath. OUR NATURAL NEEDS IN A DIGITAL WORLD by Richards Stanisich // The human essentials of shelter, sanctuary, hygiene and intimacy have remained largely unchanged for thousands of years, but technology is rapidly altering how we respond to those needs. Digital devices and the Internet of Things have evolved to be integrated and camouflaged into our lives. 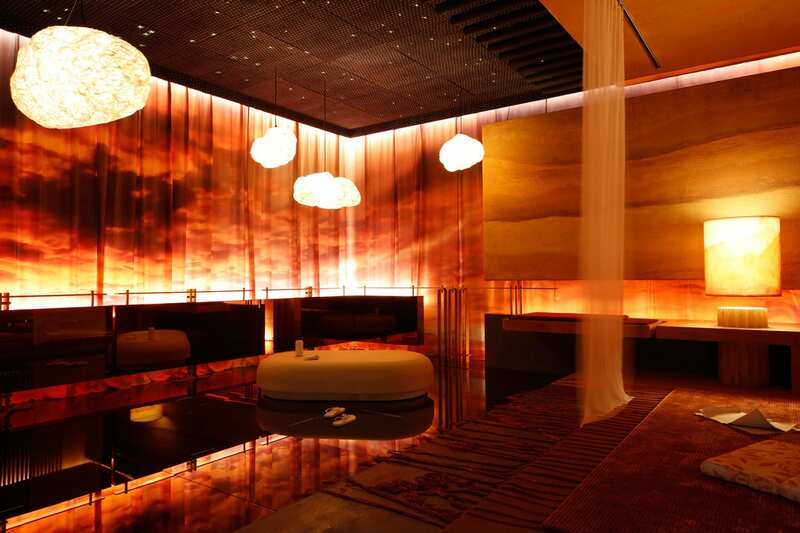 Their presence is pervasive within our living environments and is changing our sensory responses to the physical and emotional spaces we dwell in. Exposure to blue light from screens, the isolation of sound by headphones and continued exposure to new imagery have changed the way we interact with objects, and our rituals and relationships. with blue light, representing the intangible dimensions of the digital world. 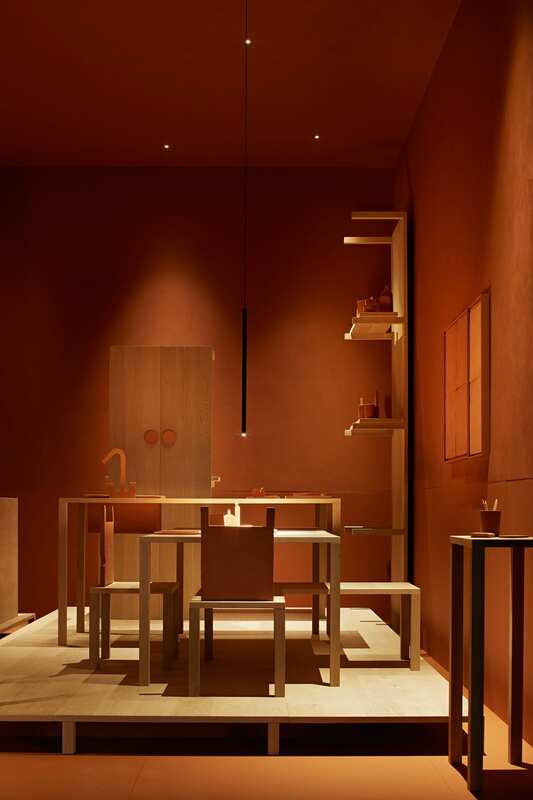 Meanwhile, in the centre of the space, the kitchen, living and sleeping zones are handmade, tactile and textural, their earthy qualities representing our natural needs. 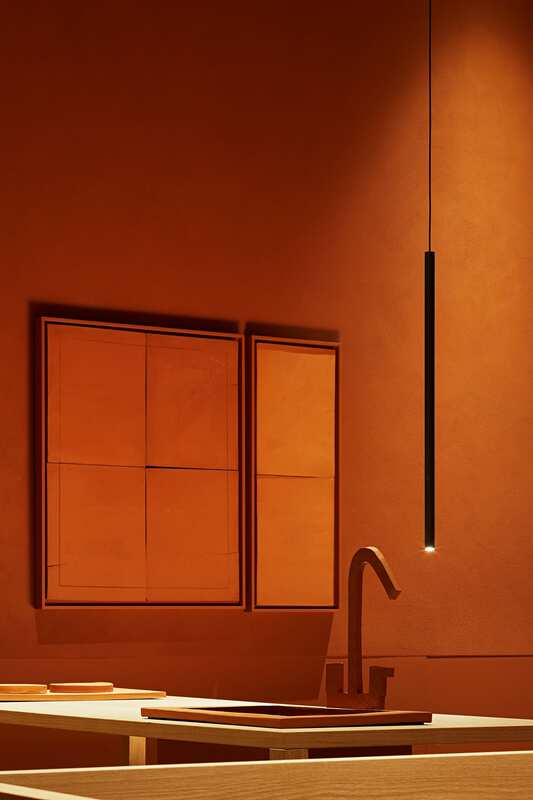 The contrast of these two realms represents the convergence and tension between two fundamental aspects of our domestic lives and question whether the digital age, fuelled by a human desire for complexity and innovation, is in turn leading us to yearn for uncomplicated natural simplicity in our physical spaces. 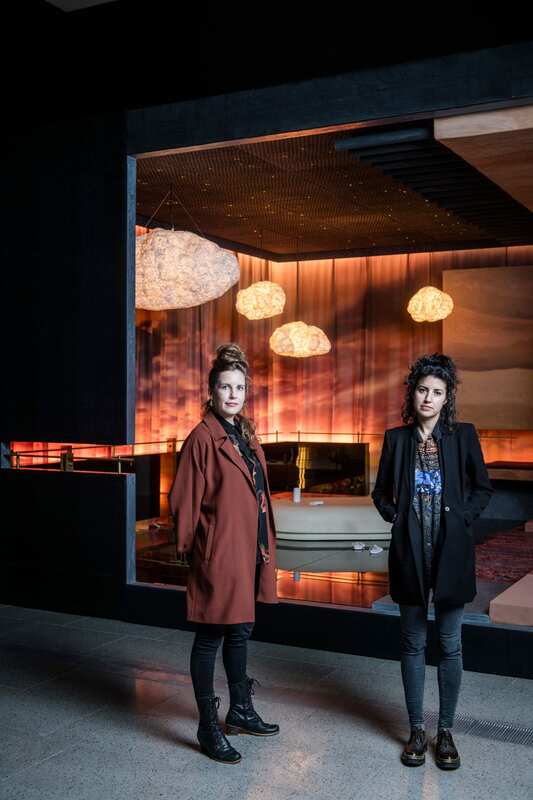 Designers Katy Svalbe and Yasmine Ghoniem in front of Take it outside, inside the Rigg Design Prize 2018 at The Ian Potter Centre: NGV Australia. Photo by Eugene Hyland. Installation view of Take it outside by Amber Road. Photography by Shannon McGrath. TAKE IT OUTSIDE by Amber Road // Take it Outside explores the transitional space between indoors and outdoors, present in many cultures, including our own. The work speaks of its makers’ multiple and shared heritages, and also reads like a list of iconic Australian-ness: a musk stick pink screen, star studded indigo sky, a blistering sunset, rammed earth, lycra, terry toweling, a pair of thongs, an akubra hat, mozzie coils, the hum of cicadas… a space that is pregnant with possibility: imagined stories, multiple layers, lived experiences, hopes and dreams. 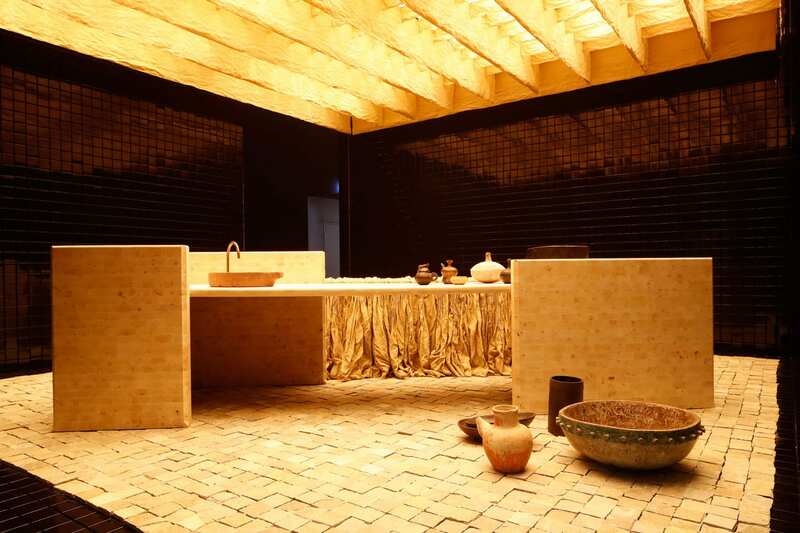 Installation view of Home: feast, bathe, rest by Arent&Pyke. Photography by Shannon McGrath. 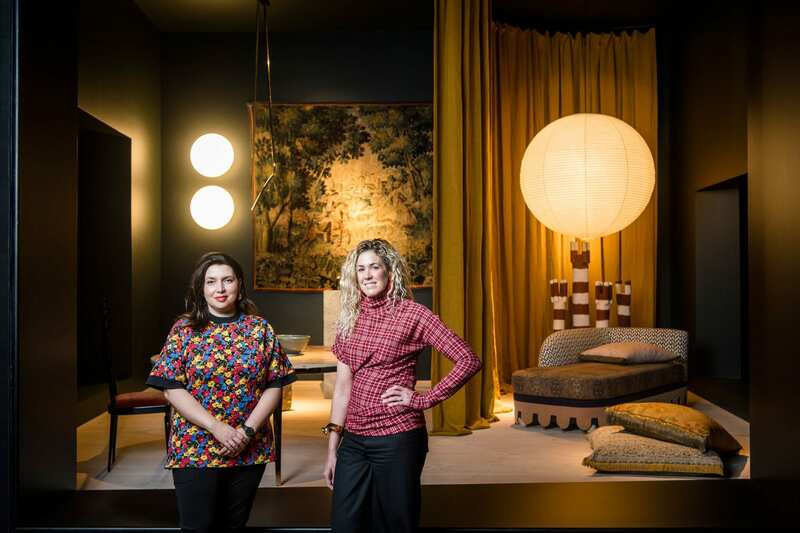 Designers Sarah-Jane Pyke and Juliette Arent and Sarah-Jane Pyke in front of Home: feast, bathe, rest, inside the Rigg Design Prize 2018 at The Ian Potter Centre: NGV Australia. Photo by Eugene Hyland. 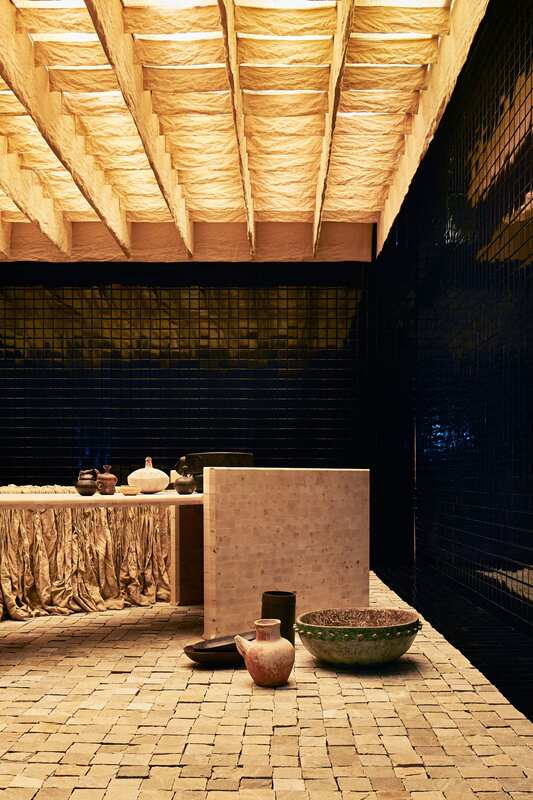 HOME: FEAST, BATHE, REST by Arent&Pyke // Juliette Arent and Sarah-Jane Pyke believe that humans are increasingly searching for restorative spaces to call home as populations increase and cities engineer themselves upwards and outwards. 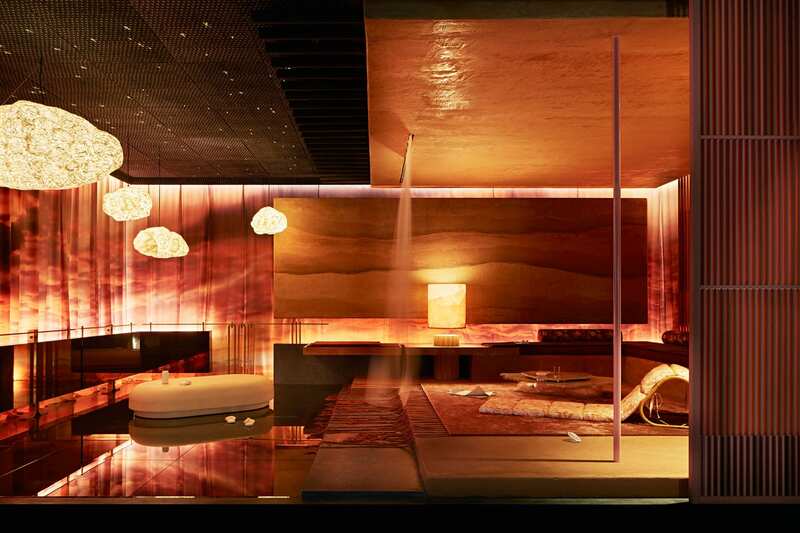 In response, they have expressed the domestic interior as the ultimate manifestation of soulful wellbeing. 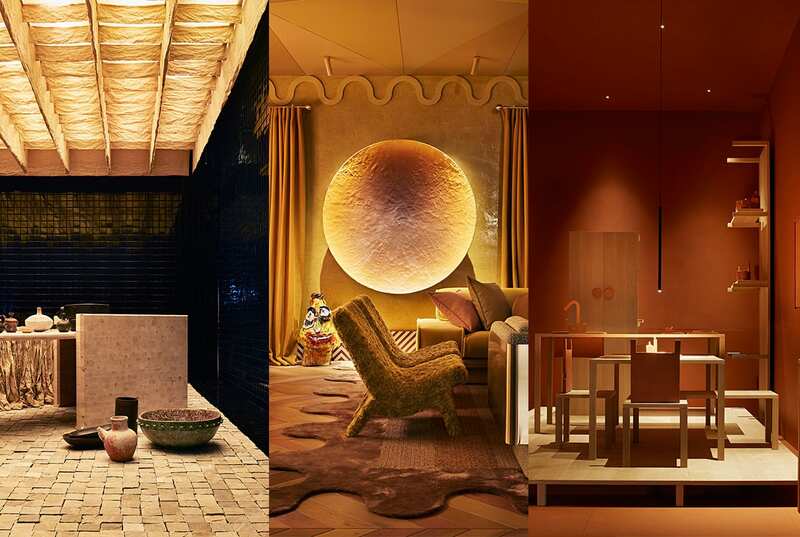 Within the room, the connection between domestic living and emotional and physical wellbeing are explored by looking into what the designers say are the essential needs of the human soul: to replenish (feast), to restore (bathe) and to retreat (rest). 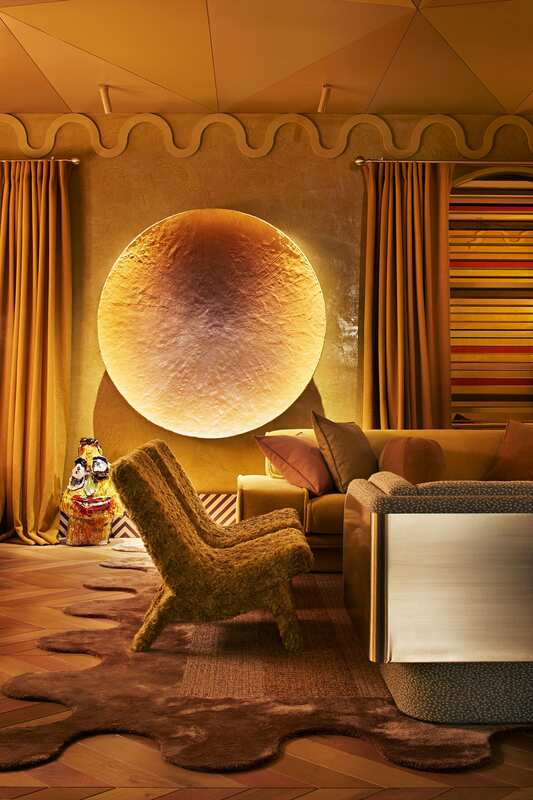 Each area features a contemporary Australian artwork and a bespoke furniture piece that speaks to the archetypal imagery of the space it inhabits. One informs the other, reminding the viewer that a home is a place in which we should find comfort in familiarity and inspiration, and delight in beauty. Installation view of We’ve boundless plains to share by Flack Studio. Photography by Shannon McGrath. 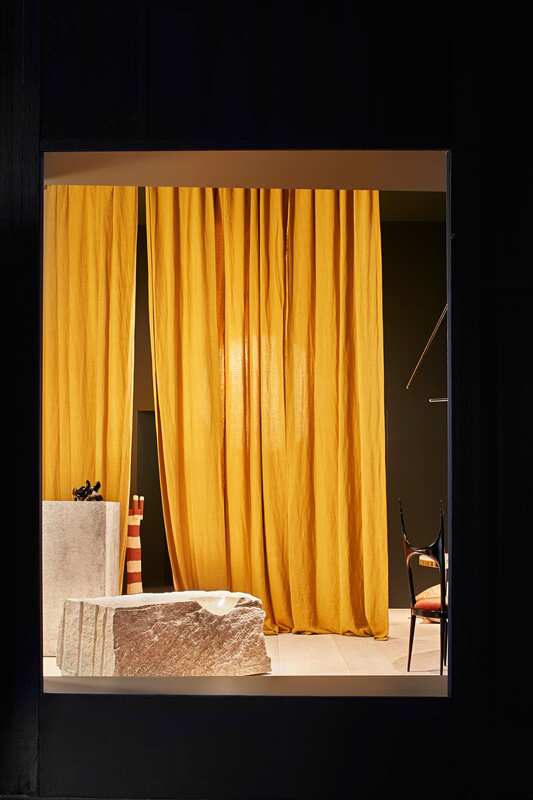 The post A Celebration of the Finest Australian Interior Design at NGV’s Rigg Design Prize 2018. appeared first on Yellowtrace.